$1,650 to enter, and least a half-million dollars in the prize pool. Two starting flights, 40-minute levels on day 1, moving to hour-long levels after Day 2's first break. 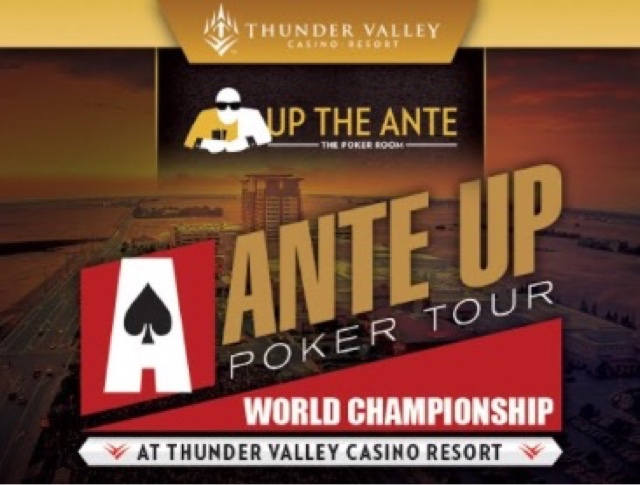 The Ante Up World Championship returns to Thunder Valley for its fourth year, one of the biggest and most enjoyable Main Events on property all year. 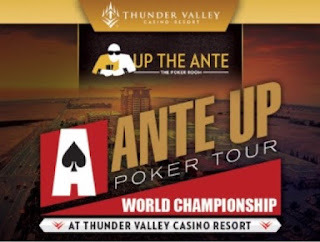 Day 1A kicks off Friday at 11am and Saturday is an 11am start for Day 1B. Registration for both flights is open until 5pm - the start of Level 9. One entry and one re-entry is allowed per player, per flight. A 75-minute dinner break is set for 7-815pm each night. Day 2 begins Sunday at noon and plays down to a winner. Find the tournament structure sheet here. A 10-seat-guaranteed $365 satellite takes place Thursday at 6pm, and a 20-seat-guaranteed $365 satellite takes place Friday at 6pm.